The oil and gas boom has been underway for a number of years in many locations across North America, and there are now a lot of stories about individuals and families whose lives have been personally affected. This post is part of a regular weekly series of those stories on this blog to help you envision what could happen if drilling expands along the Beartooth Front, and what is possible to keep that from happening. Today’s story is not about environmental or health effects of oil and gas drilling, but about what can happen to impact the everyday lives of people who don’t deal directly with drilling. Communities change, and the way of life in an area changes as well. You can see other personal stories in this series by clicking here. Note that you can find more by clicking “Older Posts” at the bottom of the page. This story originally posted on the blog Oil Field Dispatch by Amy Dalrymple on May 18, 2014. At 31, Michelle Thomas is back living at home, but it’s not by choice. The Williston woman was forced to move in with her grandmother in Bainville, Mont., after her apartment building was sold and the new owner increased the rent. Thomas said she learned on January 20 that her rent of $550 a month for a one-bedroom in Williston’s Park Village Apartments would increase to $900 in March. In addition, the new building owner required tenants to pay a higher security deposit, she said. For Thomas, she would have been required to pay an additional $700 on top of the $200 deposit she paid when she moved in 10 years ago. The building is more than 30 years old, according to information from the Williams County Assessor’s Office. Thomas works two part-time jobs in Williston as an administrative assistant and as a custodian for her church. But the two jobs together don’t pay enough for her to afford Williston’s high rent prices on her own. “A lot of single people are having difficulty,” Thomas said. Thomas has been living on her own since she was 18. Now she is back living in the home where she grew up and renting a storage unit for some of her belongings. “It’s hard, especially when you’re used to your own space,” Thomas said. Thomas now commutes 28 miles one-way to Williston, which can be challenging with busy oilfield traffic and road construction. She allows an hour to get to work on time and often takes Williston’s temporary truck reliever route to avoid the congestion. She estimates she drives at least an extra 350 miles each week now. Thomas recently had to replace her windshield after a rock came through the glass. During a late spring snowstorm, her Ford Focus went into the ditch during her commute. “It ended up being a costly day,” Thomas said. Thomas has started to look at jobs in other communities. But her family lives in the area and she doesn’t want to move. “I’ve seen a lot of my friends leave because of this,” Thomas said. 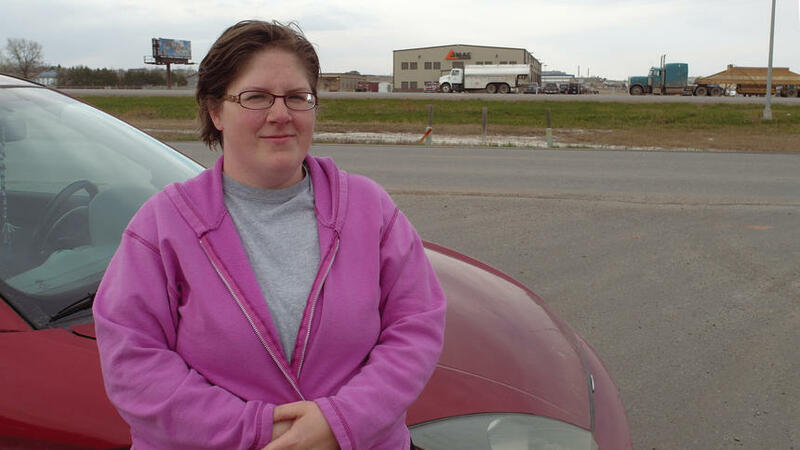 This entry was posted in Bakken, Personal stories and tagged Bakken, Michelle Thomas, North Dakota, personal stories, Williston. Bookmark the permalink.